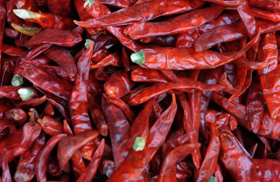 Add spice to your food with this organic Red Chilly. Choose from the variety of chilies for crafting gravies, curries, pickles, snacks, chutneys and seasoning powders at shrihtrading.com. Capsicum frutescence is a perennial chilli with small sized pods which are highly pungent. It is commonly known as ‘bird chilli’ and ‘Tabasco’. chilli is reported to be a native of South America and is widely distributed in all tropical and sub tropical countries including India. Now it is grown all over the world except in colder parts. Paprika, Byadgi chilli, Warangal Chapatta and similar high colour less pungent varieties are widely used for colour extraction. This colour is highly popular among food and beverage processors for its use as a colourant, since this being a ‘natural plant colour’. Red chillies are very rich in Vitamin C and Pro-vitamin A. Yellow and especially Green chillies (which are essentially unripe fruits) contain a considerably lower amount of both substances. In addition, peppers are a good source of most B Vitamins, and Vitamin B6 in particular. They are very high in Potassium, Magnesium and Iron. Their high Vitamin C content can also substantially increase the uptake of Non-Heme Iron from other ingredients in a meal, such as beans and grains. As a medicine it is used as a counter irritant in Lumbago, Neuralgia, and Rheumatic disorders. Capsicum has a tonic and carminative action. Taken inordinately it may cause gastro-enteritis. 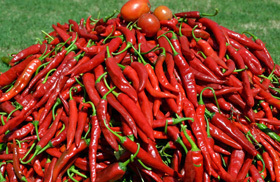 The enzyme isolated from chilli is used in the treatment of certain type of cancers. Oleoresin capsicum is used in pain balms and vaporubs. Dehydrated green chilli is a good source of Vitamin ‘C’. Guntur (Andhra Pradesh), Tamilnadu or Gujarat, India. Deluxe, Best, Medium Best and Medium. 5 – 7 cm, 8-10 cm, 10-12 cm and 12 cm & above. With & With out as per customer requirement. Thick & Thin as per customer requirement. Packing Standard packs of 3, 4 or 5 Kg in PP bags (With out Stem) and 10, 20 or 25 Kg in CFB boxs or Fresh Jute bags, as per customer requirements. Optional : Health & Aflotaxin Certificates, as per cuetomer requirement. Port of Loading : Tuticorin, Chennai or Cochin, India. Port of Discharge : As per customer requirements. Shipment Terms :FOB / CFR / CIF as per Inco Terms 2010 and as per Customer requirements. Pre-shipment Inspection : SGS or as per customer requirement for Weight and Quality. Payment Terms : 30% Advance by T/T, 70% by Irrevocable L/C. Delivery to Loading Port :Within 15 days from the date of receipt of Confirmed Purchase Order & Receipt of Payment Instruments (Advance & L/C).